On Monday, The Times of India reported that India is trying to “fast-track” the finalization of its ambitious plan to launch its largest-ever aircraft carrier. The newspaper cited defense sources as saying that the ongoing detailed naval study for the indigenous aircraft carrier-II (IAC-II), which will be called INS Vishal, has gained urgency. The renewed urgency allegedly comes amidst the confirmation earlier this month New Delhi is set to retire one of its two current aircraft carriers, the INS Viraat – which was acquired from the United Kingdom in 1987 – in early 2016 following the International Fleet Review in Visakhapatnam. This will then leave the Indian navy with just one aircraft carrier, the INS Vikramaditya which was procured from Russia in 2013. The new INS Vikrant, India’s first indigenously built aircraft carrier, is currently under construction in southern India and is expected to be ready only by around 2018 or 2019. India’s ultimate goal, former rear admiral Ravi Vohra recently said, is the eventual establishment of a five-carrier fleet comprising a mix of large and small carriers. Despite media reports of the fast-tacking of the proposed 65,000 ton INS Vishal – which would be India’s largest aircraft carrier – it is unclear exactly what this “urgency” may actually mean for the project’s timeline. One officer told The Times of India that a few more months will be needed to finalize specifics like the exact tonnage, the type of propulsion as well as other parameters, following which the Indian government will “take the final call.” Indian officials have reportedly said that it will take at least 10 to 12 years to construct it. Aside from the timeline, Indian officials also say that they are seriously considering boosting the INS Vishal’s capabilities. Most of the recent attention has been focused on the prospects for equipping the carrier with the Electromagnetic Aircraft Launch System (EMALS). EMALS, which was developed by the US firm General Atomics (GA) for the US Navy’s Gerald R. Ford-class carriers, would enable aircraft to be launched both faster and easier, thus allowing India to carry larger, bulkier and more heavily armed aircraft relative to a ski-jump launch system. 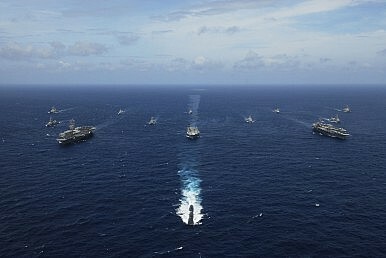 While the idea itself had been under consideration for a while, the establishment of a U.S.-India working group on aircraft carrier technology sharing and design, along with positive comments by GA’s chief executive officer for global strategic development Vivek Lall earlier this month, suggests that there is some promise. Vijay Sakhuja, director of the Defense Ministry-funded National Maritime Foundation think tank, says U.S. involvement in the flight-launch technology of an Indian carrier could also lead to future deals further down the line such as joint development of fighter jets. Of course, those familiar with Indian defense issues will know that there is too often a vast gap between rhetoric and reality. The construction of the INS Vikrant has already been delayed by four years with repeated technical and budgetary issues. Furthermore, despite the recent hype about U.S. assistance, certain conditions will need to be met before advanced technologies like EMALS can be exported to India for inclusion in the INS Vishal.